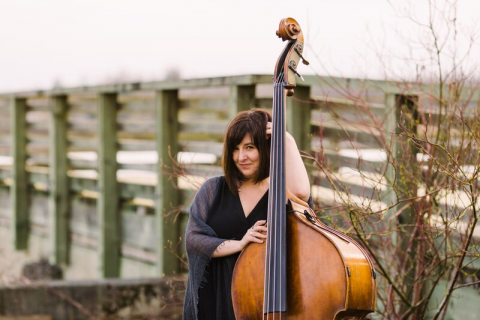 Juno-nominated bassist, composer, bandleader, and educator Jodi Proznick has earned a reputation as one of Canada's finest jazz artists. She has won numerous National Jazz Awards, including Bassist of the Year in '08 and'09. Her group, the Jodi Proznick Quartet, was awarded the Acoustic Group of the Year and Album of the Year in '08 and the Galaxie Rising Star at the Vancouver International Jazz Festival in '00. In addition to leading her own group, Jodi has performed with many of Canada's top jazz musicians, including PJ Perry, Don Thompson, Kirk MacDonald, Hugh Fraser, Oliver Gannon, Dee Daniels, Phil Dwyer, and Laila Biali. She is regularly in demand to perform and record with visiting jazz artists including Michael Bublé, Byron Stripling, Michael Feinstein, David "Fathead" Newman, Bucky Pizzarelli, Ed Thigpen, Jeff Hamilton, Peter Bernstein, Charles McPherson, Seamus Blake, George Coleman, Sheila Jordan, Mark Murphy, Harold Mabern, Eric Alexander, and Lewis Nash. In addition to recording her own Juno-nominated CD as a leader, Jodi has been featured on over 30 recordings as a sideman.